In the two previous installments of this series I talked about my love of all-things analog and some of the tools and gear I like to use to get things done. My love of analog also extends into many other aspects of my life, especially the creative endeavors I pursue. A major one of these creative endeavors is photography. It shouldn’t surprise you to learn I use film for the majority of my photography. Sometimes I do use a digital camera or an iPhone, especially when I’m photographing my fast-moving toddler. But most of the time it’s film, film, film. My history with film goes back a long way. Back to the days when digital was just a word and not the revolutionary technology it is today. Back when film was the only option. My first camera was an Olympus OM1, which is an SLR that uses 35mm film. From the moment I took it out of the box, loaded it with film and pressed the shutter to make my first photo, I was hooked. Since that day I’ve made photos for countless personal and professional projects and have many, many notebooks full of negatives and boxes full of slides. I also took quite a few photo classes, developed my own negatives and made my own prints in a darkroom. As much as I love analog, I also love gadgets and technology. So, as any good tech aficionado would, I embraced digital and jumped in with both feet. My first digital camera was a Kodak DC240. By today’s standards, the DC240 is laughably antiquated. But it made photos and I could see them instantly on the little screen on the back of the camera. I didn’t have to wait for them to be developed and printed. In fact, I could download them to my computer and print them myself at home. Instant gratification. I have to admit, at the time, I thought it was pretty amazing. In truth, I still kinda do. But as I explored digital, and made thousands and thousands of photos, I came to realize something: I wasn’t enjoying photography anymore. Also, the quality of my images had declined. Not the resolution, sharpness or that kind of “quality.” Those were ever-increasing as technology got better and better. Because it was easier, faster and I didn’t have to think much about focus, exposure or anything else, I pretty much stopped thinking about my photos at all. I stopped caring and just became a button pusher. And my photos suffered for it. Things went on like this for quite a while until something happened: I found two of my film cameras. They had been packed away in a box several moves ago and forgotten. Seeing them for the first time in years, I was intrigued. So, I did some research and discovered film was still around. I unpacked the cameras and took a closer look. They seemed to work just fine so I bought a roll of film, loaded one of them and made some photos. I didn’t have any way to process the film at home, having sold my darkroom equipment long ago, so I took it to one of the only film labs left in Austin, Holland Photo. I thought I’d be annoyed or impatient at having to wait to see the photos, but something else happened instead: I got excited. Excited to see how they turned out. The anticipation became part of the fun. Then I got them back. I’ll be honest, most of them weren’t that great. Going back to a manual camera after years of auto everything was a humbling experience. But even with the focus and exposure issues, there was still something about them. I liked them. Even the bad ones. Plus, I had actually enjoyed the experience of taking the photos. It had been really fun. And I wanted to do it again. So, I bought more film and made more photos. With each roll I got a little better and enjoyed it more. I took my time and thought a lot about exposure, focus and composition. It was almost as if I was learning photography for the first time. And as I went along I noticed something: the end result, my photos, started to get a lot better. Before I go on I should mention I don’t think I’m an amazing photographer. But I can tell an “ok” photo from a good one and a great one from an amazing work of art. Most of mine fall into the “good” category and I’m happy with the results I get most of the time. Could I improve? Absolutely. I’m working on it pretty much every day. And that’s part of what I’m talking about here: I want to get better. Photography, like many other kinds of art, is a process. With film, I love the process a hell of a lot more than I did with digital. With film making a comeback (or at least it seems like it is) people who use it talk a lot about why they prefer it. They say it’s the process or they enjoy slowing down and taking time to make the images. I agree with that. There’s something about the way light strikes film, causes a chemical reaction and, after processing, an image to appear. To me, that’s the very essence of analog. I also like that I can’t just hold the button down and hope for one or two “good ones.” Film costs money. Processing cost money. Scanning costs money. Every time I press the shutter it costs money. I need to make the photos count. I need to take my time and do I good job and only press the button when I have exactly what I want, or as close to it as possible. This has also improved my photography. Plus, I just like the “look” of film. The aesthetic of it. It’s what I grew up with. My perception of reality was shaped, to a large degree, by seeing the world depicted on film in photographs, on tv and in movies. To me, the world looks more “real” when you see it on film. Who knows? Maybe I would have rediscovered my love for photography if I’d never found those film cameras? Maybe I would have figured all of this out if I’d keep shooting digital? I don’t really think so. I believe it was film that helped me find my love and passion for photography again. Although, to be perfectly honest, I don’t really think about how I got here all that much, unless I’m writing about it like I am now. I just go out and try to make the best photos I can. Don’t worry, I’m not trying to convince you to shoot film. Nor am I saying digital is bad. This is what works for me. If you enjoy or use digital, by all means keep doing it. There’s many situations where it absolutely makes sense. I’m not trying to get you to change. As for me, I’ll keep shooting film as long as I can. I primarily shoot 35mm film so my two main cameras are the Leica M6 and the Nikon FM2n. I usually keep the M6 loaded with black & white and the Nikon loaded with color. I love both of these cameras and could see myself being happy with either as my only camera if I had to pick just one. First, let’s talk about the Leica M6. It’s an amazing piece of gear that works flawlessly, considering it’s over twenty years old. Much has been written about Leica, and the M6 in particular, so I won’t get into a full review here. In brief, the Leica M6 is a rangefinder camera made in Germany. It’s smaller than an SLR and quieter, mostly because it doesn’t have a mirror that has to get out of the way every time you press the shutter. A traditional SLR has a mirror (and a prism) because you are actually looking through the lens while composing and focusing. The mirror and prism allow you to do this. Then, when you press the shutter release, the mirror flips up out of the way so the film can be exposed to light when the shutter opens and closes. Being a rangefinder, the Leica doesn’t do this because you are composing and focusing through a different set of glass then what you take the photo with. Not having a mirror and prism also means the camera (and the lenses) can be smaller. It may sound complicated, but it works really well. The Leica is also quiet because of its shutter. The shutter is made of cloth, not metal like the Nikon, so it moves almost silently. All of this, the size, the weight and the near silent operation, make the Leica an ideal camera for intimate situations where something bigger or noisier might be an issue. It’s also a pleasure to shoot. The size and weight make it easier to carry around for long periods of time, as I often do when I’m on the streets shooting. Focusing it is also quite easy with its split image system. I find it a bit easier to focus quickly than the Nikon. Plus, it has a meter, which is quite accurate. Although, I don’t use it very often. The Nikon is different from the Leica but still a great camera. It’s an SLR so it’s bigger, a bit heavier and has a metal shutter. It’s louder too. But, it’s pleasure to shoot. The controls make sense and the meter is accurate and easy to understand. I’ve made some of my favorite images with the Nikon. Like I said, I love both of these cameras. They each have their quirks, but it’s like having two children: I could never pick a favorite. Fortunately, I won’t need too. I can just use them until they break or I can’t see well enough to focus or my hands don’t work well enough to load the film. In truth, both of these cameras will likely outlast me. They are quality tools that should last a lifetime (or longer). One potential drawback to both of these cameras, at least for some, is they’re both completely manual. This means you set the ISO (only once when you first load the film), the shutter speed, the aperture and you focus. Then, you press the shutter release. After that, you need to advance the film manually in order to take another picture. No auto advance here. In other words, you do all the work. If you’ve been used to just pointing and shooting, you’ll likely have a bit of a learning curve if you decide on one of these cameras. And yes, when you’re just starting out you’ll likely forget to advance the film and miss a great photo opportunity. It happens. Both cameras also have a TTL meter, which can be useful. But I don’t really need one. I’ve seen enough lighting situations and I know these cameras and the film I use to be able to set the exposure without a meter. I’m usually dead on or pretty close. I also shoot mostly black & white, which has a lot of latitude, so that helps with exposure issues. If you’re getting back into film after a long absence or just starting out, black & white is a great choice. It’s more forgiving of mistakes and also less expensive than color. I use both Ilford HP5+ and Kodak Tri-X. Try them both and see which you prefer. I’ve also gotten much better at manual focusing after years of auto. These days, I can pretty much nail that too. Of course, it helps to have excellent lenses and a larger depth of field to make sure what you want in focus is in focus. But really, I worry more about composition than sharpness. Sharpness is overrated. I won’t get into a lot of “how to take photos” stuff in this article. That’s something for another time. There’s also plenty of articles out there to explain basic photography, Zone Focus, Zone Exposure or the “Sunny 16” rule. That said, if you have questions, feel free to ask. I’ll do what I can to help. Turning to lenses, I only have three at the moment. I used to have quite a few, but I sold them. I have two for the Leica and one for the Nikon. 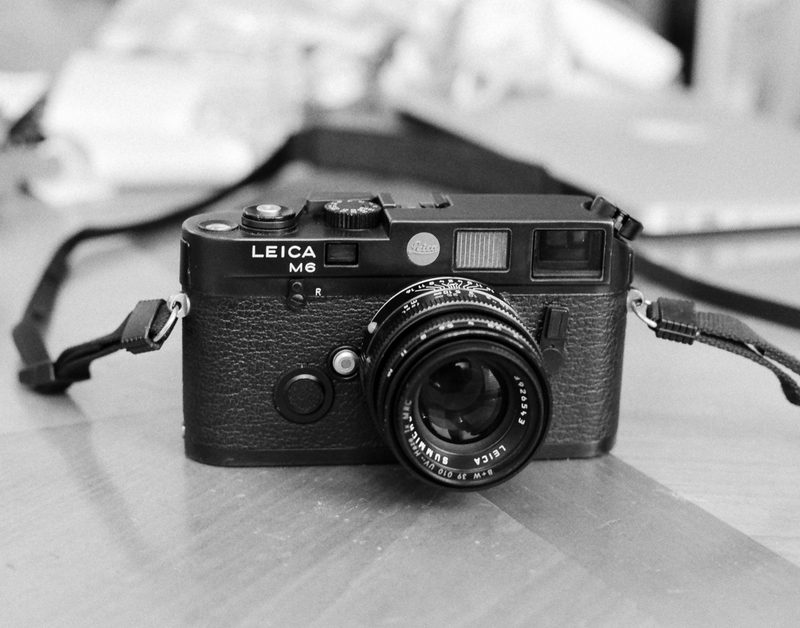 For the Leica, I almost always prefer the 35mm focul length. At the moment, that means the Zeiss Biogon T 2.8. I also have a Leica 50mm Summicron 2.0, mostly for portraits. For the Nikon, it’s all 50mm all the time in the form of a Nikon 1.8. I prefer a 50mm lens on an SLR. It just seems right to me. The truth is you don’t really need a lot of prime lenses, or a big zoom, to make good photos. When I go out to shot I have one lens on each camera. If I want to get closer, I take a few steps closer. If I want to get wider, I just move back a little. If you only have one lens you never have to think about what you would do with a different one. You just think about making the best image you can with what you have. I’m a big believer in this. Do the best with what you have. I wasn’t always this way. I loved gear and bought a lot of it. But now I know that was part of the problem. I was looking at the gear to make my photos better. I thought fancy tools (and a lot of them) would make me a better photographer. I was wrong. The gear can’t help you. Not really. It might give you an advantage in some situations, but it can also get in the way. The photos I take now with a manual film camera and one lens are a lot better, and more satisfying creatively, than they were when I had the most expensive, coolest gear you could buy. Limits are good for you. Don’t be afraid of them. They make you try harder. They make you care more. This entry was posted in Analog, Cool Stuff, Personal, Photography and tagged 35mm, Analog, Analog Photography, Black & White, Cameras, Digital, Film, Going Analog, HP5, Ilford, Kodak, Leica, Leica M6, Nikon, Nikon FM2n, Photography, Sunny 16 Rule, Tools, Tri-X, Zone Focus. Bookmark the permalink.